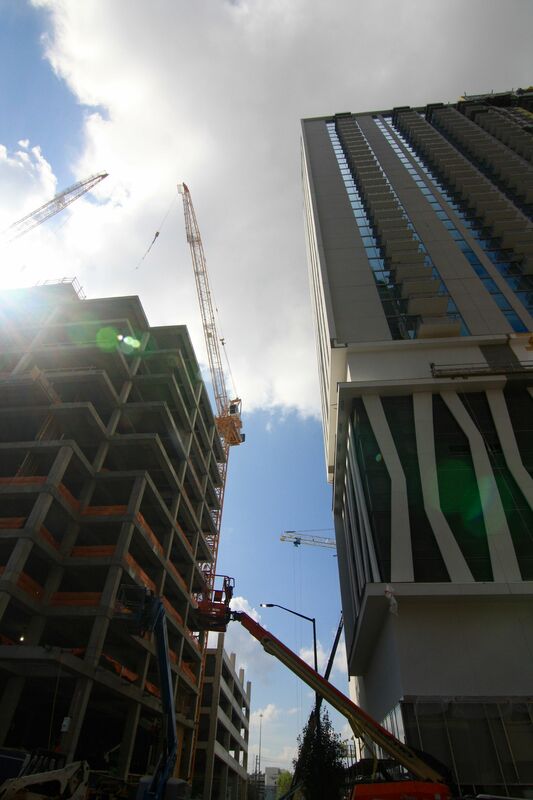 Much of St. Pete’s high-rise construction boom has occurred in close proximity to the city’s downtown waterfront, but the new tower — named Icon Central — further validates the appeal of St. Pete’s Central Avenue corridor to developers and investors. The innovative, modern architecture is changing the face of the burgeoning city and revitalized downtown area. The Arlington St. Pete, ICON’s first addition to the evolution, has concluded sales and construction. The blending of full concrete block construction with wood accents, enormous windows, contemporary accents and bold colors make the buildings along Arlington Ave N unmistakable, and the rooftop living spaces immediately catch the attention of all passersby. Two new communities are available nearby including The District on 9th and Uptown Kenwood, which are currently selling from the $300s. The communities offer multiple townhome floorplans ranging from 1,400 to 2,600 square feet with myriad customizable finishes and upgrades to select from. Residents of both will have easy access to many cultural pursuits including dog-friendly cafes, a variety of museums and art galleries, numerous local breweries and world class beaches. The District on 9th is located just two blocks from Central Avenue near the new urban Publix and will include private rooftop terraces, live-work units, and the ultimate in pedestrian connectivity to the surrounding area. Construction on the initial phase has begun and is scheduled for completion around summer 2018. Uptown Kenwood is situated in the Historic Kenwood area, framed by quaint tree-lined brick streets, art galleries and historic bungalows. Uptown Kenwood will feature a community pool, dog park and a gathering area with fire pit while the townhomes will offer private balconies and lush green surroundings to relax and entertain. Uptown Kenwood is preparing to break ground on construction for the initial phase, scheduled for completion around summer 2018. 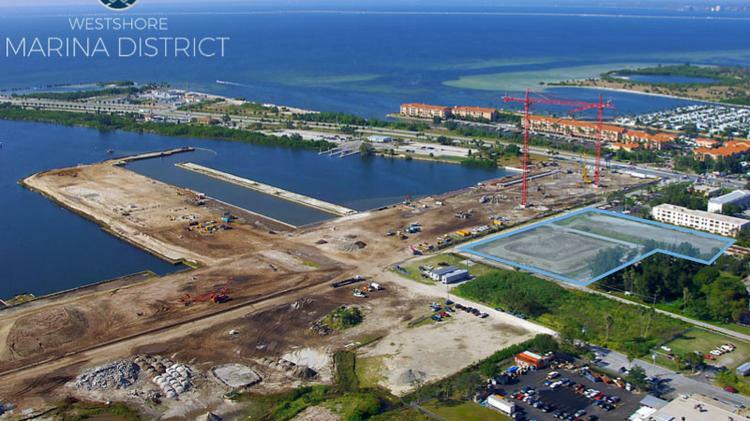 For more information, visit www.districton9thstpete.com and www.uptownkenwoodstpete.com or email info@iconresliving.com. In the Midtown Atlanta, its always an easy walk to a MARTA rail station, or an even shorter hop to a bus stop. Walk to 150+ restaurants, 300+ acres of parks and greenspace, world class arts and attractions, shopping, events and festivals. In addition to the city’s most walkable environment, Midtown Atlanta serves cyclists with 16 miles of bike lanes and a bikeshare program. Midtown’s accessibility is unparalleled, with easy access to I-75/85, and connections to the bustling Westside via five bridges. Midtown is also home to dozens of ZipCar locations. By far, the easiest way around Midtown Atlanta is in foot. 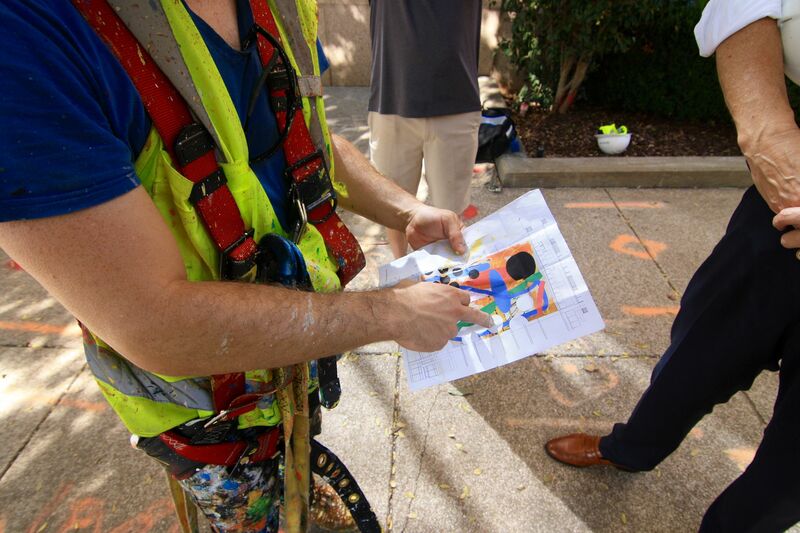 With 14 miles of new sidewalks – featuring streetlights, more than 700 trees and new public plazas and pocket parks – there’s never been a better time to stroll Midtown. Download your Midtown Walking Map. The rental perfection at Icon Midtown Atlanta comes hand-in-glove with the personalized attention of your very own team of Management and Service Professionals, always at the ready to ensure your apartment and your life are as perfectly trouble-free as they can be. You’ll love the indulgent convenience of our concierge approach to apartment living that makes no special request too large or too small–from personal shopping to design assistance to helping you navigate unexpected demands and beyond–we’re here for you in the truest sense of the word, right where you live. Life can be complicated enough. At Icon Midtown Apartments we strive to provide you with a luxurious home that is a welcomed respite from the rigors of everyday life. The moment you walk in you feel the difference. 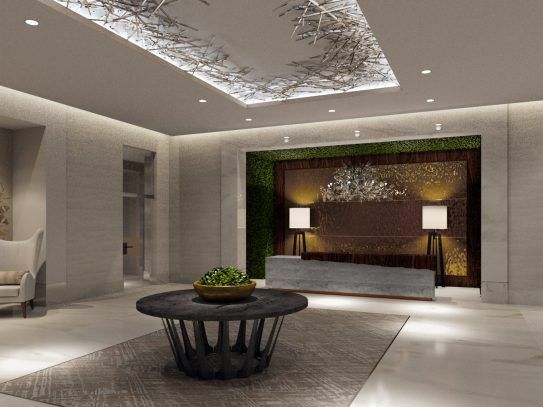 Our professional concierge service, state of the art ﬁtness center with private spa, expansive eleventh ﬂoor pool and intimate gathering spaces along with a private rooftop club is just the beginning of a brand new Midtown Atlanta residential experience. 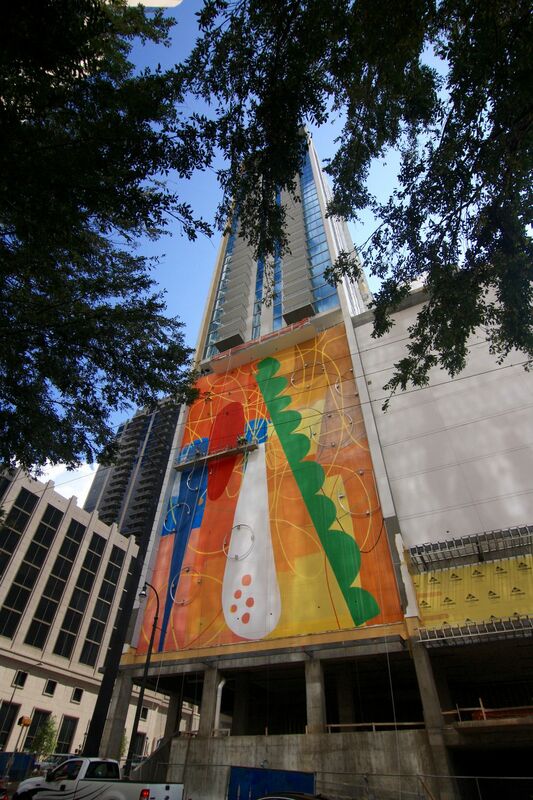 Icon Midtown Atlanta Apartments are now open and available for viewing. Call today! 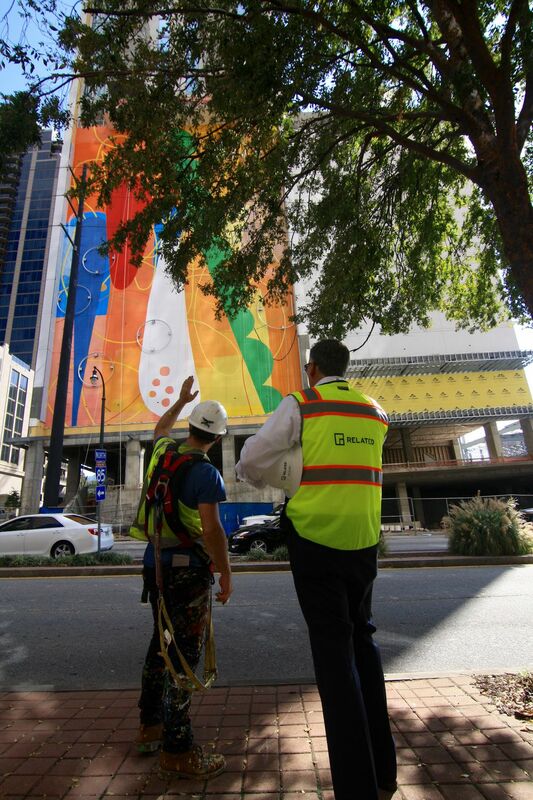 Midtown Atlanta is a vibrant and innovative community. It’s an impressive mix of nature, energy, culture, history and business. This vibrant walkable area offers a quality of life that is simply unmatched. 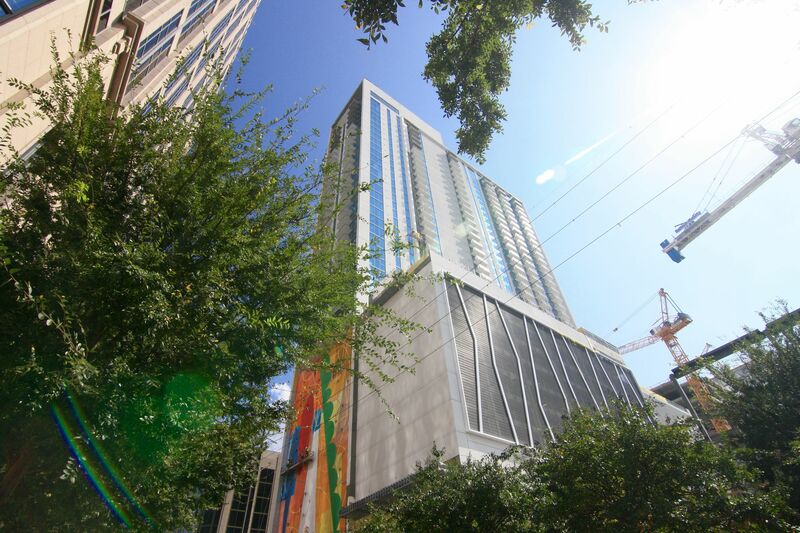 Icon Midtown offers exemplary studio, one, two and three bedroom apartments to choose from. Life at Icon Midtown Atlanta Apartments is defined by distinction, beginning with sleek, modern architecture that dominates the Midtown Atlanta skyline; drinks the daytime sun into bright, airy spaces; and turns each night into a glittering carpet of lights below. 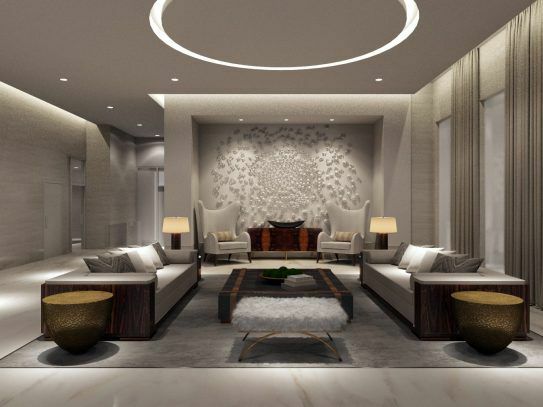 Enter Icon Midtown Atlanta and be immediately embraced by the deep sense of calm that comes when supreme luxury meets superior service. 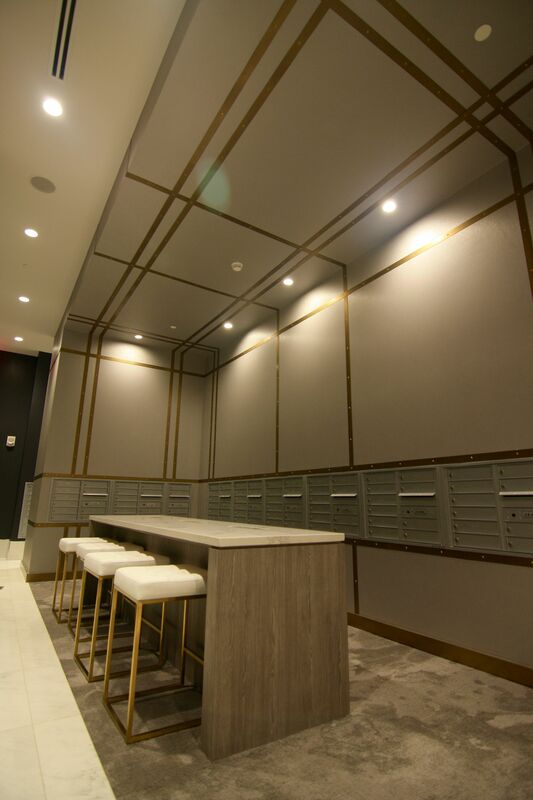 With an incredible thirty-three apartment styles to select from, you’re certain to find the apartment at Icon Midtown Atlanta Apartments that’s absolutely perfect for your wants, needs, and desires. A rapidly changing 14th Street. 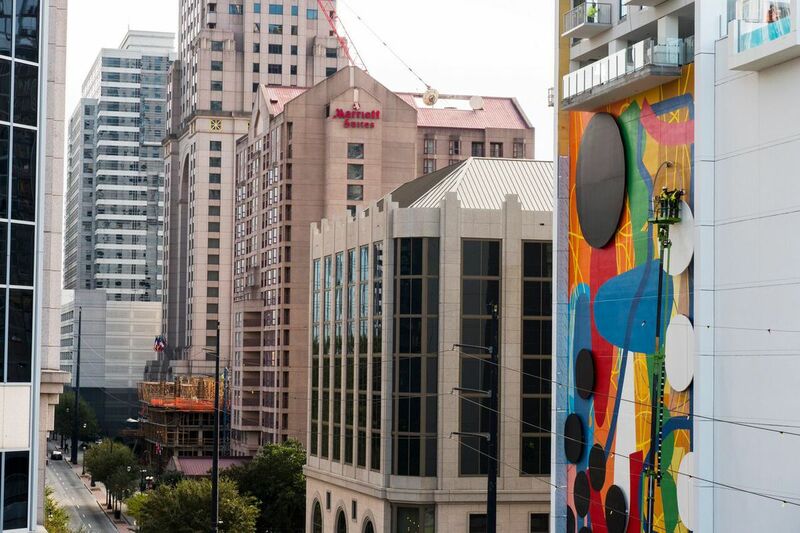 Atlanta’s biggest, boldest, public-art statement in recent memory is a wrap. For the most part. 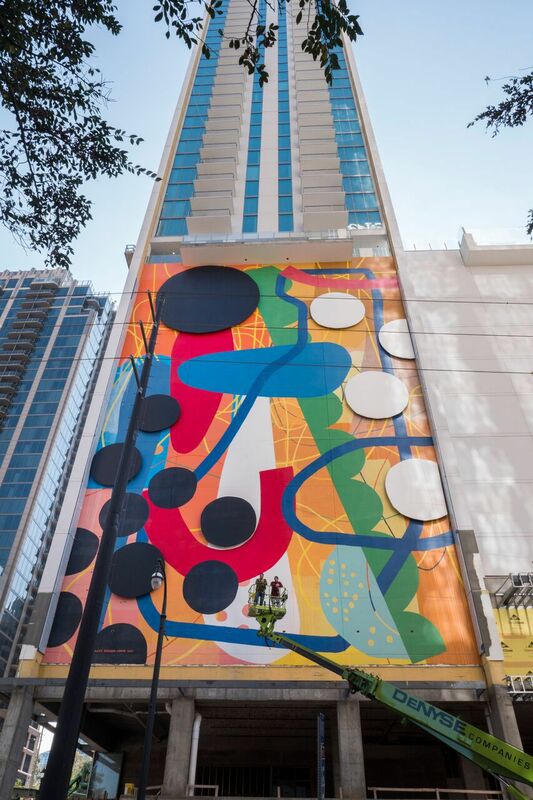 At Icon Midtown, Atlanta’s tallest new Apartment tower in a decade, the muralist HENSE has completed an untitled piece that measures 86 feet tall and 65 feet wide. For a 3-D effect, circular aluminum panels dot the work—spanning up to 24 feet themselves—and will be backlit to produce a glow. 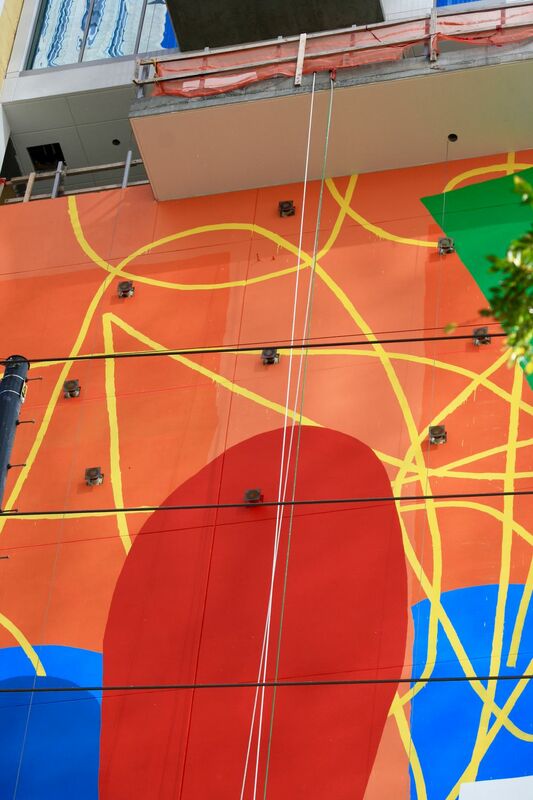 HENSE, aka Alex Brewer, was a prolific Atlanta graffitist who transitioned to mural and gallery work and now claims commissions around the world. 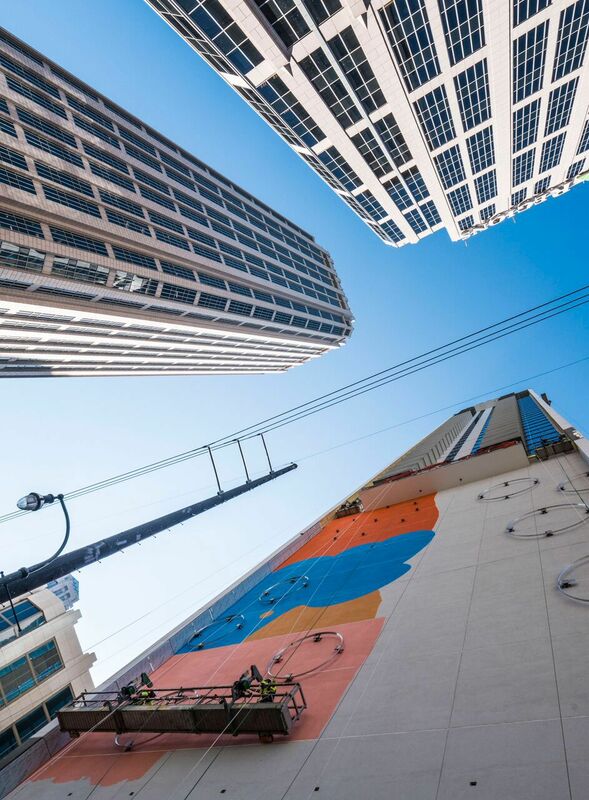 Lording over West Peachtree and 14th streets, his first piece to incorporate lighting is an array of geometric abstracts that nods to his recent sculptural work. The $118-million venture is Florida-based Related Development’s first foray into Georgia. 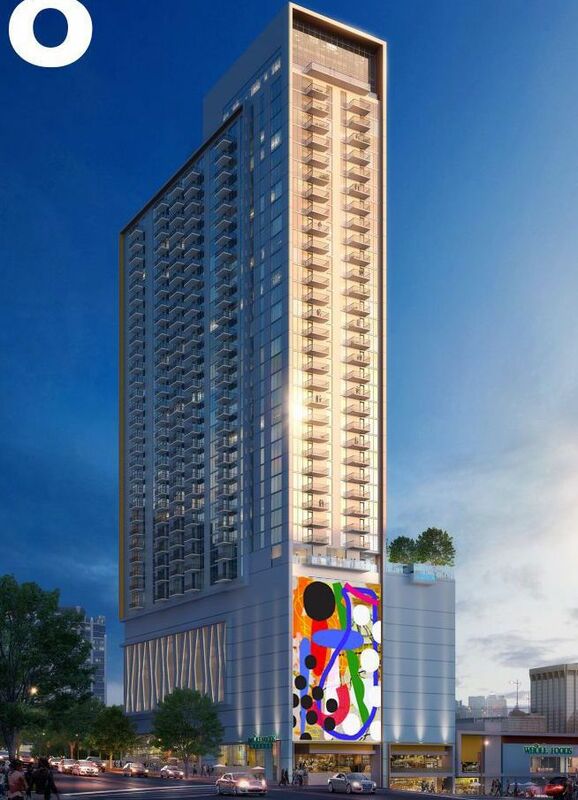 Upscale Icon will offer 390 apartments ranging from studios up three-bedrooms flats (from 601 to 1,478 square feet). Rents, we’re told, are still being finalized. Allen expects the 39-story project to wrap in early 2018, with a highly anticipated Whole Foods (and pub) at Spring and 14th streets. 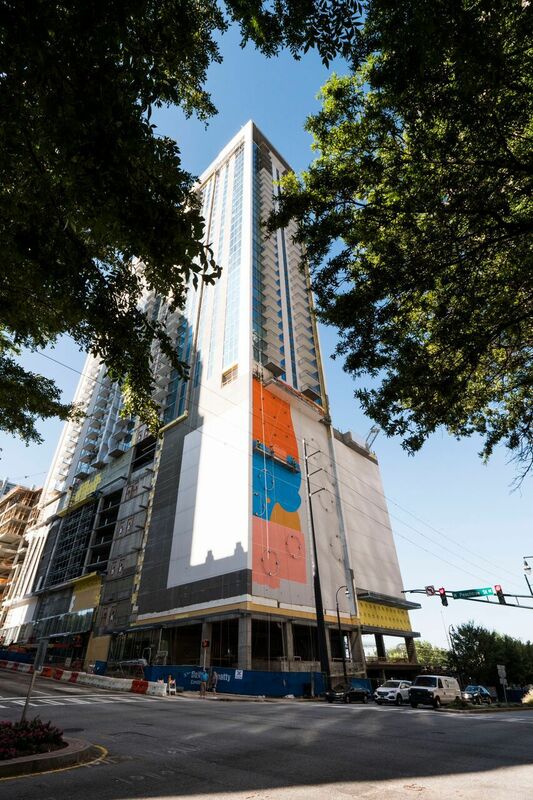 Elsewhere, a 4,000-square-foot restaurant slot will be situated along West Peachtree. The site was formerly two surface parking lots. 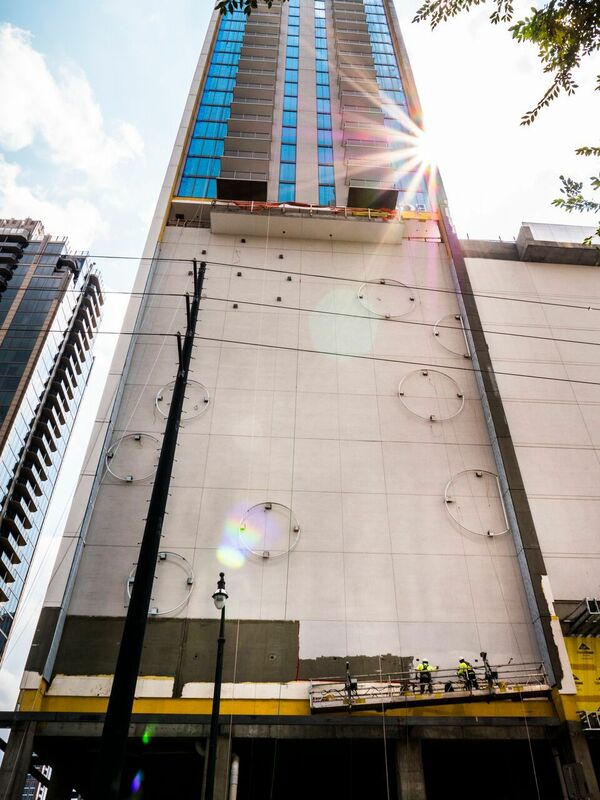 The blank slate at West Peachtree and 14th streets in early September. The project on Sept. 25. 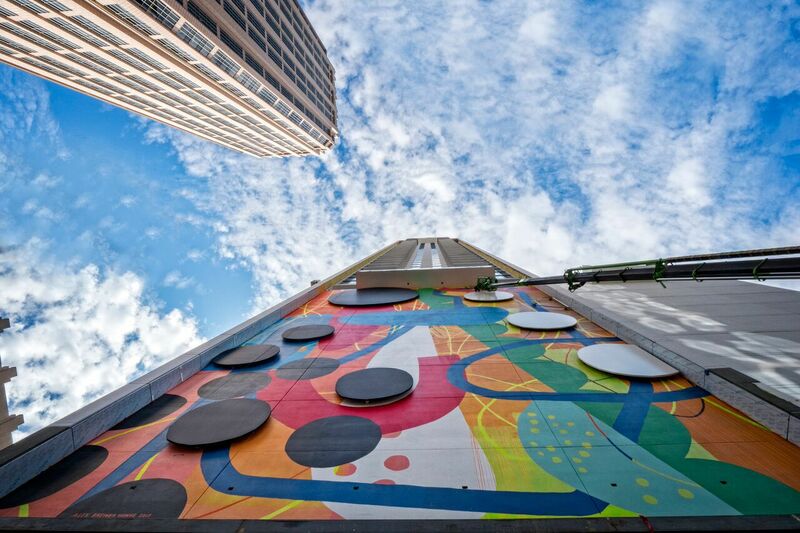 The tower and mural project as of Oct. 11. The artist discussing progress with Ed Allen, Related’s senior vice president of development. As seen from the back of Icon’s property, parking-garage screening and Northside Hospital’s medical tower. This image gives a sense of the project’s scale. At top right is a communal hot tub with an aquarium side overlooking 14th Street. 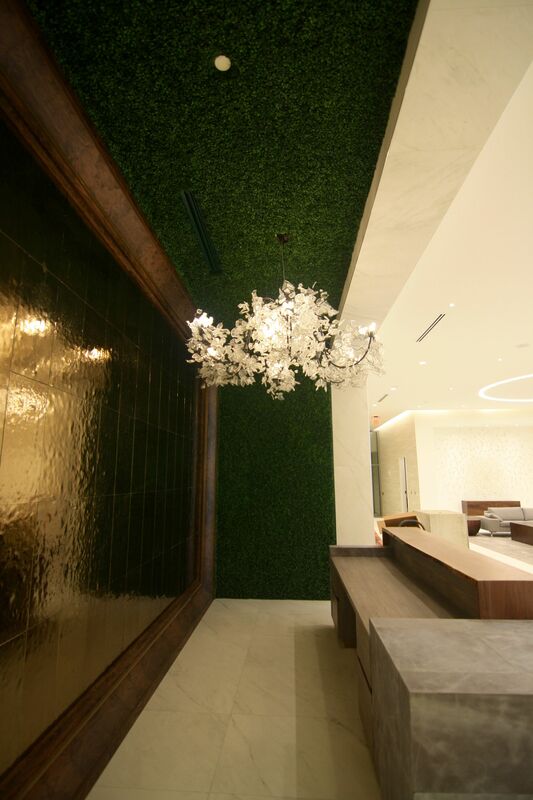 Large aluminum panels lend a three-dimensional effect. 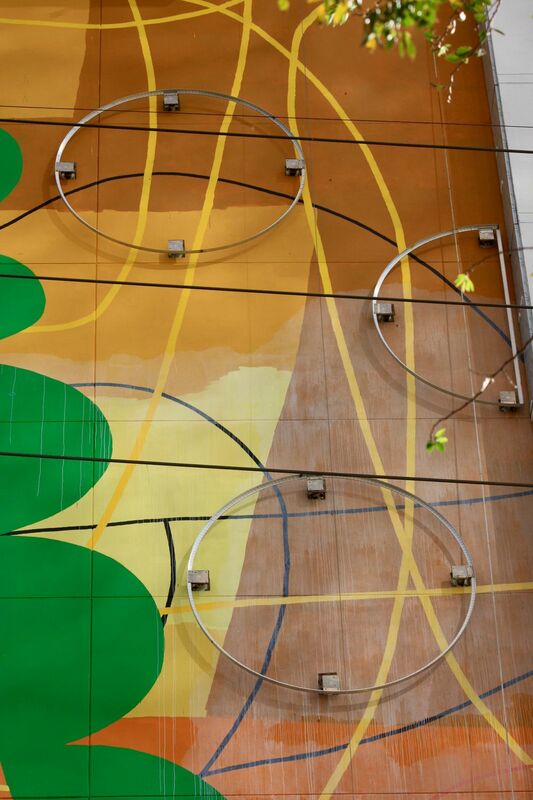 Back-lighting behind the panels and downlighting from above will make the mural glow at night, developers say. The finished piece, pending lighting. 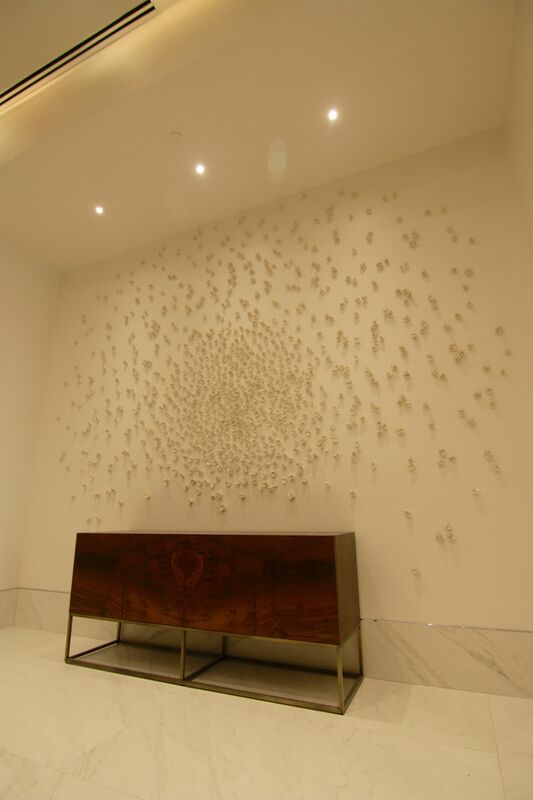 This wall of ceramic blossoms is by Austin artist J Prichard. 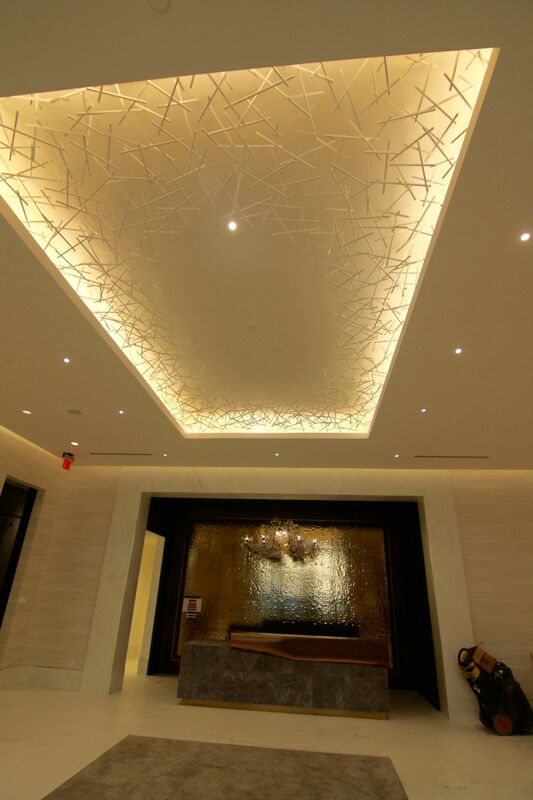 Interiors by Atlanta-based Hibachi Designs (seen under construction in October) include a ceiling installation by Ridgely Studio Works of Toronto. Even the mailroom takes inspiration from Gucci. A rendering depicting the finished lobby area. The 420-foot structure topped out in May. Developers expect it to be finished in early 2018. Icon Midtown Apartments Now open for tours! A luxury residential development near the intersection of Westshore and Gandy boulevards has landed a construction loan. SunTrust Bank is the lender, Related said. A mortgage has not been yet been filed in Hillsborough County. Town Westshore Marina Apartments is part of the Westshore Marina District, a mixed-use development underway on the Westshore waterfront. BTI Partners, based in Fort Lauderdale, is the master developer of the project. Helping to break ground on the new Manor Apartments Riverwalk, Tampa mayor Bob Buckhorn’s vision of the new downtown is surely, but slowly becoming a reality. “It is the beginning of a dream come true,” he said. The waterfront apartments will be built on the site of the old Tampa Tribune building on South Parker Street. Its developer, The Related Group has decided to take on the project solo. On top of the 400 luxury apartments that will be built at Manor Riverwalk, Perez says he is committed to also developing more affordable housing. “We’ve made it a company philosophy, when we go into an area, to also try to provide for those people so they can live in the city,” said Perez. Perez’s new property will also include an extension of Tampa’s Riverwalk on the west side. The mayor says the city has most of the development agreements that will take the Riverwalk up to Rick’s on the River. Maitland’s last evidence of orange groves is soon to become apartments and shops with the Related Group’s $10 million purchase of 20 acres on Maitland Boulevard. Construction is expected to start this week clearing the lake-pocketed site for Town Trelago apartments. Work is expected to start on the 350-unit apartment community in the next three or four months and completion planned in about two years. Residents surrounding Lake Hope had long opposed development of almost 100 acres on the north side of Maitland Boulevard, just east of Interstate 4. Zoning for the overall 96-acre site, known as Maitland Concourse North, was approved in 2016 by the city, according to the Land Advisors team representing the Related Group. Robbins described the residential plans calling for 13 buildings two-story apartment buildings facing lakefront. Three-story apartment buildings are closer to a planned retail center with 130,000 square feet. Apartment amenities are expected to include a clubhouse, fitness center with steam room, and outdoor trails. Alachua County Skywarn maintains a listserv to provide email alerts of hurricane/tropical storm information for the Atlantic and Gulf of Mexico regions. Information is generated at the National Hurricane Center. ALERT FM is an aggregator of State and Local emergency information with multiple contact paths for mass notification. Emergency information is delivered via the data subcarrier of existing FM radio stations, SMS (text) and email. This personal alert and messaging system allows emergency management officials to create and send digital alerts and messages to recipients such as first responders, school officials, businesses, and citizens based on geographic or organizational groupings. Such alerts and messages might include NOAA weather warnings, evacuation instructions, homeland security notices, Amber Alerts, or school closings. AudioNow™ lets broadcasters reach over 300 million cell phone users at no incremental cost through our proprietary patent pending technology. Users can now listen to your broadcasts on any phone. No expensive phones or data plans necessary!” AudioNow provides mobile streaming to any mobile device. Listeners can access the latest local National Weather Service forecast by calling any of the numbers below. This is a beta service which is only provided in the Washington DC metro area at this time. Chicago Weather Center provides a website to stay up to date on weather information and the latest severe weather alerts. You may also opt-in for weather alerts from their weather app. The app for iPhone is available at – https://itunes.apple.com/us/app/wgn-tv-chicago-weather-center/id447145667?mt=8 . The app for Android phones is available at – https://play.google.com/store/apps/details?id=com.wgn.android.weather&feature=search_result . The CodeRED Mobile Alert app is a service of Emergency Communications Network, the nation’s leading provider of high-speed emergency and mass notification messaging services. The app provides users local alerts initiated by authorized public safety officials who use the CodeRED community notification system, as well as dozens of customizable location-based severe weather warnings issued by the National Weather Service. Users may select the types of warnings they would like to receive and set a personal warning radius. Users may view the exact location of the alert using an interactive map as well as alert details. WeatherRadios.com focuses on weather radio products and specializes in weather alert accessories for deaf and hard-of-hearing individuals including wireless transmitters/receivers, pillow vibrators and strobe lights. DialMyCalls is a completely web-based system that sends emergency weather alerts via phone call, text message, and email. Weather data is pulled from the NWS & DialMyCalls is also is an integration partner with IPAWS/ FEMA warning system. Account can also be accessed from any computer with internet access. Also offers iPhone/Android apps as well as a toll-free number to dial into to send broadcasts in times where power may be out, or are on the road. FREE Emergency Notification of Breaking Weather Alerts Health, Homeland & Cyber Info sent to your email & wireless device. This National Weather Service (NWS) FTPMAIL server is intended to allow Internet access for users who do not have direct access to the World Wide Web but who are equipped with an e-mail system. The service is free and no signup is required. Using FTPMAIL, users can request files from NWS and have them automatically e-mailed back to them. Note: This service does not provide automated alerts–user request is required to receive products. WDT’s iMap services provide dynamic interactive and mobile weather mapping solutions for the world’s leading local media and Internet companies. WDT is a global leader in providing state-of-the-science weather detection, nowcasting, and forecasting systems. Not every site will open for every evacuation. For Miami-Dade shelter addresses and evacuation routes, click here or dial 3-1-1 to find out which shelters will be open when an evacuation is announced. For Broward shelter addresses and evacuation routes, click here or dial the emergency hotline at 3-1-1 or 954-831-4000. Monroe County shelters will not open for Category 3,4, or 5 hurricanes. For more information about where to evacuate in the event of a Category 3 or higher, check the Monroe County Emergency Management website before a storm or call 1-800-955-5504.